What comes to mind when hearing the Swiss name, most people's minds will be fixed on the Alps. Yep! Swiis is widely known as the Alps. But, make no mistake, actually, tourist destinations in Western European countries bordering with Germany, France, Italy, Austria, and Liechtenstein has many things that can make the tourists fall in love and always want to go back there again. From the beautiful beginnings of nature to the beauty of the building-building like the kingdoms in storybooks. Lake Geneva Lake Geneva belongs to one of the most beautiful lakes in the world and the largest in Europe with an area of about 600 sq. Km. In addition, you will enjoy the beauty of the crescent-shaped lake seen from this height, you can also do yacht sports that will make you become healthier. You can also swim in Bains de Paquis or just relax in one of the lakeside parks or cafes. To enjoy a unique city view in Geneva you must spend an hour or two on a boat trip on this lake. The Chillon CastleChillon Castle is located in the town of Montreux which was built in the mid-12th century and was renovated in the 13th century by Pietro II. The beautiful building like a castle in this Dongen country used to function as a fortress. In every corner of the room, you will find a charming artistic design. More beautifully, this castle is located on the edge of Lake Lac Leman or Lake Geneva. So you can enjoy the view of the lake in this castle if you've been to this castle and guaranteed you will not be disappointed if you've been to this castle place. Schilthorn and Piz GloriaEver watch a James Bond movie "On Her Majesty's Secret Service"? surely you are not familiar with this place. The view of the Alps is not to be missed. In this place, you can enjoy the scenery without having to tire around the mountains. 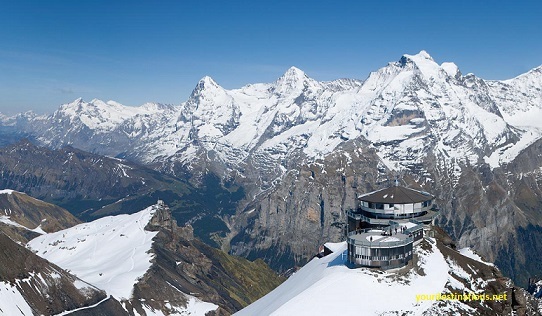 The Schilthorn is a name contained in the Alps while Piz Gloria is a rotating restaurant on the top of Schilthorn mountain. This restaurant is the first rotating restaurant in the world, so you are not tired of turning the mountains. Interlaken is located in the Bern area, Switzerland, and is one of the best tourist attractions in the world. Interlaken is one of the best places in the world to do outdoor sports. It is home to a number of companies providing the best services for the sky, parachuting, hanging out, browsing canyon, and paragliding. Well, if you visit this place in September who knows you will be lucky to be able to witness the big event held in this city. The Jungfrau Marathon and the Unspunnenfest Festival are held every 12 years featuring the Swiss culture. Other events are also commonly held such as wrestling competitions, the Greenfield Music Festival, as well as Red Bull Air Race World Series, an air race celebrated on July 15th. The Fountain of Geneva Jet D'eau Does not say already to Swiis if you have not visited Geneva Jet D'eau. The world's tallest fountain that projects water up to 140 meters tall you can see. The fountain made in 1891 is considered a symbol of the city of Geneva so it is not complete your trip to Switzerland if you do not visit this place to enjoy the beauty of this waterfall is not to be missed because it will not disappoint you if you have been to this tourist spot. Swiss National ParkThe Swiss National Park was established in 1914 with a total area of up to half of Switzerland. If you want to see the animals here is the place. Some animals you can see like eagles, marmots and more. But still must be vigilant if visiting this place, because in this park there are also wild animals. This is a very worthy park to visit because this park is included in UNESCO cultural heritage area. In addition, entry into this park is free so you can save your wallet. However, visitors are not allowed to set up tents and spend the night in this park. Expensive Cities when you get to Switzerland, do not miss a visit to Zurich in the heart of Europe. Although included in one of the world's most expensive living cities, the city of Zurich is one of the best quality of life in the world. As a tourist city in Switzerland, Zurich offers many things. Historic buildings, museums, unique architectural churches, exclusive shopping spots, city parks, and well-laid out waters. In fact, no less than twenty-five million daily tourists visit Zurich each year. Aletsch Glacier, Warisan Dunia UnescoAletsch Glacier is the longest and most beautiful glacier in the Alps with a length of 23 km. This area is on the UNESCO world heritage list so it is protected and limited by external zones. Here you can climb to the highest peak. The natural scenery is also not less beautiful with the location of other tours that become the attraction of this place so this place is never empty with visitors who came to this place because of the beautiful scenery that exists in this place. City of Lucerne or Luzerne city of Luzern lies on the banks of Lake Luzern and close to Pilates mountain, Rigi, Titlis makes the view multiply. In the town of Luzern, there is a wooden bridge named Chapel which stands on the river Reuss is thought to be the oldest wooden bridge in the world. There is also a Jesuit church that has a charming classic design. This church still holds ancient paintings and sculptures. You can also visit the Chapel Bridge with its charm Water Tower and Lion Monument that makes you will not regret if you have been to this place of interest, especially if you are on vacation with your family not to be missed to visit this sights. That's some of the tourist destinations in Switzerland, may be an option for those of you who want to explore Swiis in the holidays later this year. Happy holiday. !! Maybe useful!